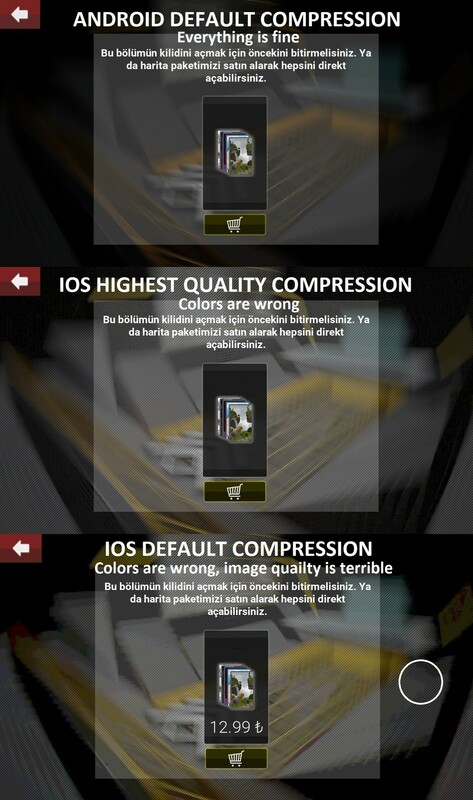 first pic maked in ue4 and second in iphone5s so how can i fix it? We default to fast PVRT compression when cooking for the device during development. You can change the compression settings for the project in the Project Settings dialog under the Rendering page. The range is from 0 (fastest and worst quality) to 4 (slowest and best quality). I would suggest 2 as a place to start. Workaround: Partially solved by setting brightness curve to 1.9. But will report a bug. Epic Games staff returned me that I should use sRGB and it is fixed.